Look out for the six White Mempat trees just outside Ridley Hall at the Singapore Botanic Gardens. 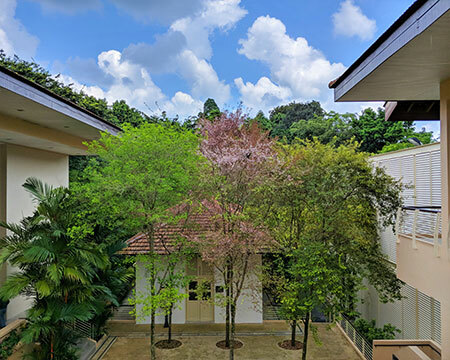 Nestled in the mezzanine floor in front of Ridley Hall at the Singapore Botanic Gardens are six trees that are rather inconspicuous throughout most of the year. Cratoxylum maingayi, more commonly known as the White Mempat, is native to Southeast Asia and found in Cambodia, Indonesia, Malaysia, Myanmar, Singapore, Thailand and Vietnam. It is one of four Cratoxylum species native to Singapore, where it can be found in Nee Soon Swamp Forest, the Mandai, Bukit Timah and Western Catchment areas, as well as the Singapore Botanic Gardens. The tree belongs in the Hypericaceae family, a flowering plant family of herbs, shrubs and trees that has simple and opposite leaves with dark or translucent dots. These dots are glands that contain essential oils which are known to protect the plants against herbivores. Some of the compounds within the glands also have pharmacological properties such as antioxidant and anti-bacterial properties, and can be used for medicinal purposes. Take a closer look at its leaves and you will notice the dark dots! The name Cratoxylon is derived from Greek, where kratos means ‘strong’ and xulon means ‘wood’, referring to the tree’s strong timber. Locally, Cratoxylum trees are sometimes cut for derum timber, but this species is not commercially exploited because of its scarcity. Conservation of this species is especially important because recent studies have reported that some compounds isolated from White Mempat have anti-malarial and anti-cancer properties. This species caught my attention about two years ago when I noticed a couple of the trees in front of Ridley Hall shedding their leaves. Assuming that the trees were declining in health, I watched them closely for about two weeks, only to be surprised by the tender pink blossoms they produced in synchrony. The pale pink flowers and deep red leaves of the White Mempat make a pretty picture. The White Mempat typically flowers in April to May and occasionally during other times of the year after a dry period and when it is slightly cooler. It is a deciduous tree, shedding its leaves entirely before presenting a spectacular show of pale pink flowers and new flushes of deep red leaves. Young leaves are red because they are rich in anthocyanins that protect the leaves from excess light and prevent the young and tender leaves from being eaten by insects. As the leaves mature, they lose their redness, but sometimes retaining a tinge of orange on the fringes. The Black Dwarf Honey Bee makes a beeline to the flowers of the White Mempat. About twenty bees were observed foraging on the tree’s flowers in October 2018. Having observed the plant-insect interactions, I have noticed that the tree is well-loved by bees. The Black Dwarf Honey Bee (Apis andreniformis) and Geissler’s Stingless Bee (Tetragonula geissleri) were seen visiting the tree in the morning, foraging on the tree’s flowers and for resin in an open wound. From these interactions, we know that the White Mempat has important ecological roles in providing food and construction materials for bees. The understanding of these interactions provides useful information on the survival of the bees as well as the survival of the trees because bees are considered crucial pollinators in tropical forests. Did you know that the White Mempat can exude a resin that helps to seal its wounds. This protects the tree from herbivores and microbes. The White Mempat exudes resin to seal its wounds, protecting it from herbivores and microbes. Stingless bees (Tetragonula geissleri) gather resin from the wound of the tree in pockets on their hind legs. This resin is used as construction material for their nest. Terpenes, a form of organic compound, from the resin are also transferred to the bees’ bodies, repelling predators such as ants. Given the importance for their nesting ecology, resin can be considered a limiting resource for stingless bees. The White Mempat may be beautiful to look at, but it makes more than just a pretty picture. 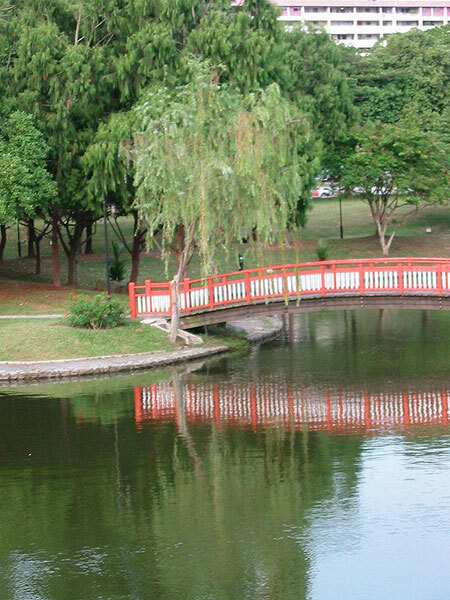 The next time you visit the Singapore Botanic Gardens, take time to enjoy the synchronous blooms of this tree. I certainly hope to do so for many years to come! Lim Siu Ann is a Horticulture and Operations manager at the Singapore Botanic Gardens. From 2015 to 2018, she was involved in the development and establishment of the Learning Forest in the Gardens. Currently, she is a manager at the National Orchid Garden, which is currently undergoing enhancements works expected to be ready later this year.